Vapor King 10ml e-liquid is great way to sample our many flavours for the fraction of the price. With these e liquid samples we are making it easier for everyone to afford vaping. So buy our 10ml e-liquid, you have over one hundred to choose from. 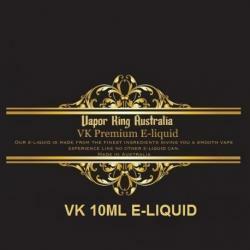 VK Premium E-liquid 10ml There are 30 products. VK American Blend Tobacco E-liquid 10ml gives you great vapor and great flavor. Our brand e-liquid is a very high quality product, customer satisfaction guaranteed, so buy now. VK Banana Split Flavor E-liquid 10ml gives you great vapor and great flavor. Our brand e-liquid is a very high quality product, customer satisfaction guaranteed, so buy now. Vapor King VK Strawberry Cream Flavor E-liquid 10ml gives you great vapor and great flavor. We should have called it "Strawberry Dream!" This delicious blend of fresh, ripe strawberries is blended into a delightful, silky, and sinfully thick sweet cream. VK Virginian Tobacco E-liquid 10ml gives you great vapor and great flavor. Our brand e-liquid is a very high quality product, customer satisfaction guaranteed, so buy now. VK Frozen Lemonade E-liquid 10ml gives you great vapor and great flavor. Our brand e-liquid is a very high quality product, customer satisfaction guaranteed, so buy now. VK Red Bull Flavor E-liquid 10ml gives you great vapor and great flavor. Our brand e-liquid is a very high quality product, customer satisfaction guaranteed, so buy now. VK Wicked Strawberry Flavor E-liquid 10ml has a delicious sweet strawberry candy taste you cannot resist. Our brand e-liquid is a very high quality product, customer satisfaction guaranteed, so buy now. VK Red Cowboy Tobacco E-liquid 10ml gives you great vapor and great flavor. Our brand e-liquid is a very high quality product, customer satisfaction guaranteed, so buy now.